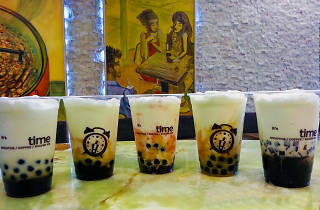 Photography: Courtesy Boba Time From left to right: Honey Boba, Honey Boba and Pudding, Strawberry, Boba, and Pudding, Caramel Boba and Pudding, Coffee Jelly and Boba. Wide windows and blonde wood walls make Boba Time the perfect afternoon haunt. The boba is soft to the core and they have options galore: smoothies, frappucinos, shaved ice, slush, iced milk, fresh juice, coffee, milk tea, and shakes. If you're feeling adventurous, try a sweet potato smoothie ($3.75). If you want to satisfy that sweet tooth and get a brain freeze to boot, try one of their "milk fluffs"—not to be confused with the shaved ice which doesn't have the same creaminess or lightness. 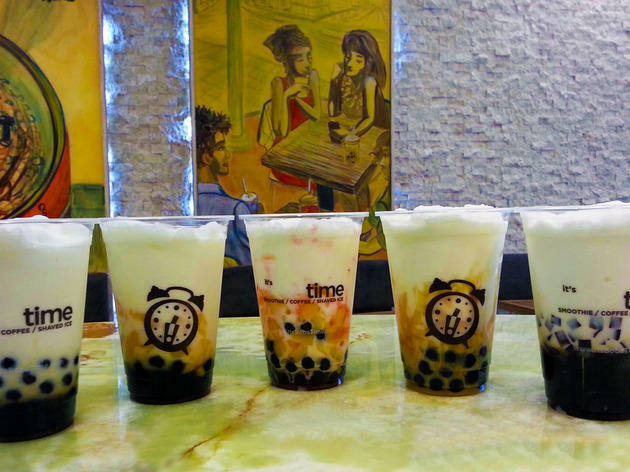 We recommend the green tea milk fluff with condensed milk drizzle, fresh strawberries and boba ($4.50). Parking is free, but it gets hectic after dark. The wifi password is their phone number (although you may have to fight for the tables near the outlet). I love me a good boba splurge and this place is the perfect fix. They have a really wide variety of flavors and options, although I usually just stick with taro slush with tapioca. From time to time I’ll order a waffle, and every time I do I get this vibe from the people work there like “Really? You’re going to make me do this?” But I understand why because it’s quite the undertaking. Kiwi, strawberries, mango, whipped cream—this thing is loaded with deliciousness. I would also highly recommend the shaved ice. I’m not cool enough to understand why people enjoy eating red beans as a dessert, but I still really enjoyed the flavors. What time is it? It’s Boba Time!